Can I go on the Kid’s Course? It’s a question that we get often here at Tree to Tree. And we get it: it’s sometimes difficult to send your young explorers on an adventure….and you want an adventure too! Our course options are broken up by age and height reach. Those ages 7+ with a reach of at least 4’7” and less than 5’11” will complete the kid’s course. There will be guides constantly circling the course from the ground to help when needed, but we do not permit adults to climb the kid’s course. Here’s why: Our courses have been designed specifically with these ages and height reaches in mind to develop an accessible, age appropriate level of adventure. Each obstacle on the kid’s courses is carefully thought-out so provide the perfect adventure. 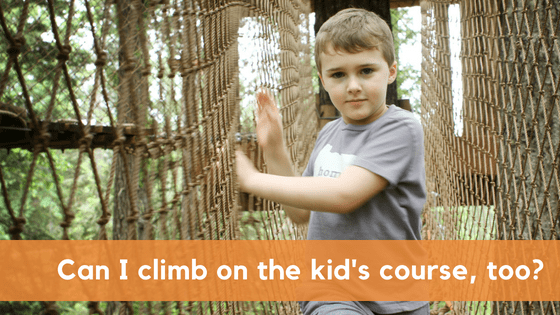 In addition, the cables on our kid’s courses are lower than those on our adult’s courses so that our youngest adventurers can easily reach to move from obstacle to obstacle on the course. For safety reason, we do not allow adult’s to complete the kid’s course due to the lower cable. Our safety system is unparalleled. We have the best safety gear, a safety (belay) line that you remain connected to at all times. We also have many procedures in place for your safety. Certified guides provide a training orientation to teach you about the course and your gear. Guides who have undergone extensive training are always watching the course. Your child will be clipped in at all times while on the course. Each participant completes an orientation session prior to climbing the course. A required orientation session must be completed by each guest prior to climbing – even if they have been to the park before! In the orientation (with a maximum of 20 guests per orientation session), each guest is shown how to properly use the equipment. Each guest then completes our orientation course (just a few feet off the ground) to familiarize themselves with the equipment – under our guides’ watchful eye. They are not rushed through this training, and are encouraged to ask questions, or repeat the orientation course, until they feel comfortable. Our guides will always be there to keep an eye on your climbers! Our courses are self-guided, meaning that our guides will not be up in the trees with guests as they’re completing the course. This allows our guests the freedom to explore at their own pace with their group. However, our guides are ALWAYS circling the courses, and there will always be an orange shirt in sight. In orientation, we teach all guest to shout “GUIDE!” three times if they ever feel unsafe or need help. Our guides will come running whenever this call is heard to help. We can’t wait to help your young adventurers out to experience something new, and to expand their comfort zones!